The Wii console has 2 USB ports. 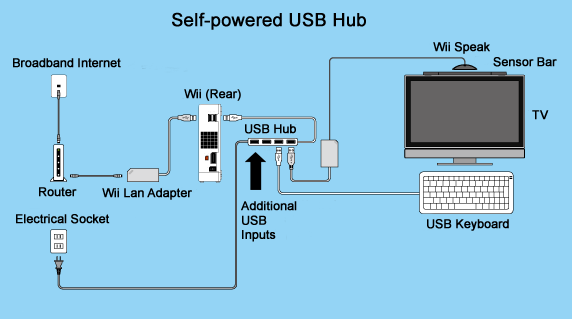 Please use a commercially available USB hub (*) when connecting 3 or more peripheral devices, such as the Wii LAN adapter, a USB keyboard, the Wii Speak accessory and other peripheral devices at the same time. There are two kinds of USB hubs, those powered from a USB port (bus-powered type) and those powered from a household socket, using an AC adapter (self-powered type). Both types may be used with the Wii console. 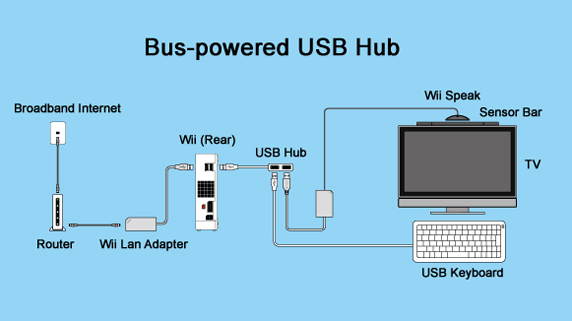 However, in case of the bus-powered type, there is a chance that multiple USB peripheral devices may not function properly since they are powered directly from the Wii console’s USB port. Please note that the Wii LAN adapter needs to be connected directly to the Wii console’s USB port or to a self-powered USB hub. However, it cannot be connected to a bus-powered USB hub. Please use this comparison sheet as a reference when using bus-powered and self-powered USB hubs. * Nintendo has not licensed any makes of commercially available USB hubs for use with the Wii console. Accordingly, Nintendo cannot guarantee that they will all be compatible with the Wii console. However, without wishing to make any particular recommendation, Nintendo can confirm that it has tested the Premium 4-Port USB hub manufactured by Logitech and that it appears to function properly.